Drink UP&GO™ for the right type of energy! 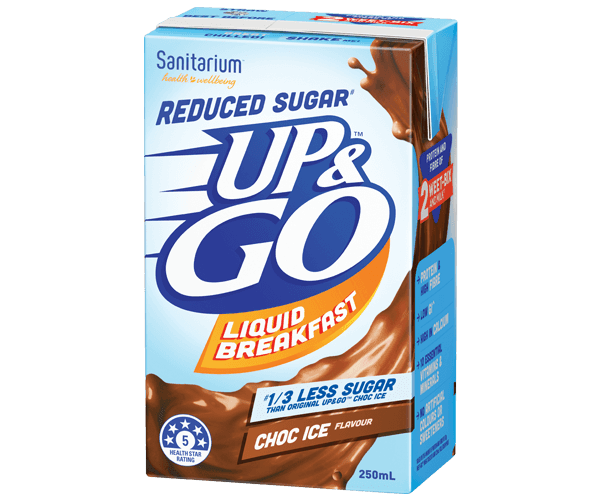 UP&GO™ Reduced Sugar# offers a nutritious start to the day with 1/3 less sugar#, a low GI^, protein and fibre. # 1/3 Less sugar than UP&GO™ Liquid Breakfast. Filtered water, maltodextrin (wheat, corn), skim milk powder, cane sugar, soy protein, vegetable fibre, vegetable oils (sunflower, canola), cocoa (0.7%), flavours, oat flour, mineral (calcium), acidity regulator (332), vegetable gums (460, 466, 407), stabiliser (452), salt, vitamins (C, niacin, A, B12, B6, B2, B1, folate).